Where do you get your food? Where did it come from? There’s a lot of questions about what you’re eating, and whether you’re doing it right. “Healthy” and “local” are words that have been thrown around a lot in the past few years. After years of attention-grabbing and debate they somehow imply some intangible idea of a higher level of eating. But, and really think about it, don’t you prefer to eat healthy food that is grown and raised near you by a farmer that you can put a name to? Keeping your fridge stocked with food that was grown in your area can be difficult, since it’s not always as simple as a last-minute trip to your grocery store chain of choice or a quick call to your rep. Getting the freshest ingredients directly from farmers in your region can be hard. We get it. And Katie’s making it easy. 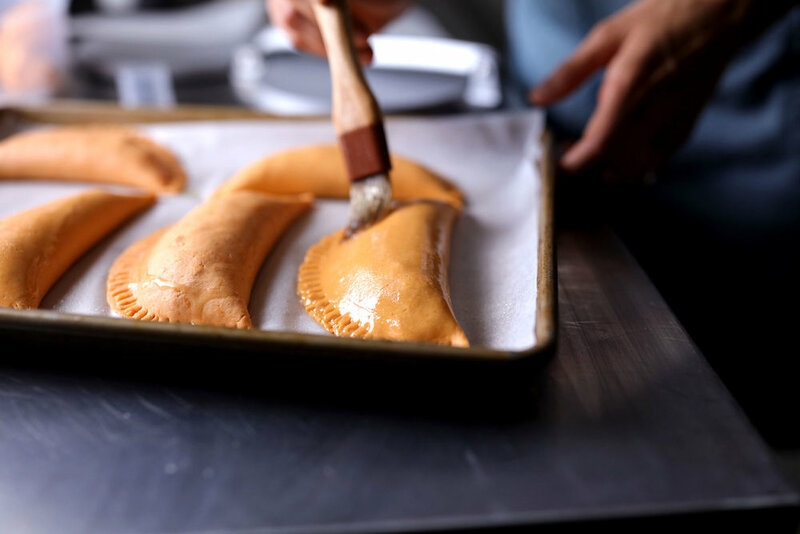 Happy Camper’s ubiquitous handpies are quick, filling, and packed with local ingredients. They’re easily accessible in local coffee shops and other small businesses around the city, catering to a diverse and on-the-go urban population. Katie connects with family-farm Rise N’ Shine and Qihe Mushrooms on Farm’d for eggs and produce to fill Happy Camper’s Everything Bagel Handpies. “Part of why I’m excited about using Farm’d is that it still allows me to feel like I’m supporting the community because I’m using local products,” Katie says. “When I was growing up, I lived right around the corner from a Goldbergs Bagels. And my dad is from New York, so we grew up eating so many bagels. In this way, Katie is making local food accessible by ordering directly from local farmers and cooking up these fresh ingredients into flavorful bites for those with a taste for convenience. Look out for Happy Camper’s newest farm-fresh flavors in the Fall Hand Pie: stuffed with an all-local kale, butternut squash, and apple salad. Find and connect with Happy Camper online, and follow Farm’d on Instagram to check out live highlights from the field in our “Chef” Story highlights.